Used to seal the trunk and tailgate areas of motor vehicles against weather, water, insects, dirt, and more. V1500 series automotive foam tape provides an airtight seal around the inner area of the trunk or tailgate and retains its durability and compression recovery through repeated open and closing. High performance weatherstripping tape protects interior areas against indoor and outdoor contaminants. PVC is also fire retardant and UV (ultra-violet light) resistant. 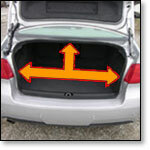 Automotive weathersealing tape is easy to peel and stick around the trunk and tailgate seal. Just peel the tape from the liner and press it into place. Allow at least 72 hours for the adhesive to reach full bond strength.